October 5 was World Communion Sunday. It is an annual event, the first Sunday of each October, in which Christians worldwide celebrate our oneness in Christ. There is a unity to the faith, scarcely as it might appear and in spite of our many differences and traditions. Special services were held around the globe testifying to this fact. At the center of these worship services were, aptly enough, Communion. Some call it the Eucharist; the Lord’s Supper; the Love Feast; the Breaking of Bread; the Sacrament of the Altar; or the Last Supper. The terms used by Christians are as varied as the particular groups which use the wine (or grape juice in some traditions) and bread. 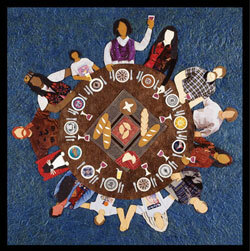 At my own Sunday meeting, we gather at the table every week observing “open communion.” A line is formed and individual worshippers wait patiently to dip a piece of bread into a common cup. All are welcome to participate. No one guards or otherwise fences the table. This is such a nice change of practice for me, because in the tradition of my formative years, the Lord’s Supper was never weekly; we might have appeared to be Catholic, God forbid. No, we took Communion quarterly, and typically we observed the ceremony at the end of a Sunday night service. We had flat, stale little wafers half the size of a postage stamp, and lukewarm grape juice in tiny, clear plastic cups (never wine). Rarely was this ritual ever explained and never was it central to our worship. It was tacked on as an amendment on a school night when folks seemed to rush through the motions. Of course it needed no explanation either, for only those “in the know” were allowed at the table. But whether we come to the Lord’s Table each day, each week, or once a year, it’s how we come to the table that is more important, I think. We must be careful with the familiar observance not to lose the wonder and sensation that Christ has given himself for us and the world. And as we are given the symbolic elements of bread and cup, we in turn give ourselves to serve and the love the world just as Jesus did. I was reminded of this when I recently attended an Episcopal service where a dear friend is the minister. It was a magnificent experience of sights, sounds, and beautifully orchestrated liturgy; so much unlike anything of my own Christian tradition, and infinitely more formal than my freewheeling approach. It took me a while to catch on and to catch up, as small children in attendance were far better acclimated to their surrounding than I was. I sluggishly stood, always a few seconds behind the crowd, and wound up standing alone, dropping to the pew after everyone else took their seat. I fumbled with the order of worship, never able to find the readings or the songs on time. By the time for the homily I was a nervous wreck, felt completely out of place, and wishing I had read “Episcopalianism for Dummies” before darkening the door. After the homily, and a number of other confusions, the invitation was offered to receive Holy Communion. Finally something I understood! But I wondered: “Will I be welcomed?” because churches have tons of rules about who can and can’t participate – even fellow believers. I gladly discovered that the invitation was for all. Even those who felt out of place had a place at the table. As I knelt at the altar I was joined by a young family; dad, mom, and three small children. The youngest, four or five years old, stood right beside me at the rail, too short to kneel. I looked at him and smiled. He smiled in return, wiped his wet lips with the back of his tiny hand and coarsely whispered, in a voice that could have been heard at the back of the sanctuary, “This is going to be good!” And it was, because it’s always good to be welcomed to the table.